50 IGAD members – split into three key discussion groups, came up with concrete plans of action aimed at opening up access to agricultural data – the RDA’s mission. Here’s an overview of what was discussed. The IGAD breakout group on Interoperability and Availability, chaired by Pascal Neveu (INRA), Cyril Pommier (INRA) and Valeria Pesce (GODAN/GFAR) including 19 experts from Japan, France, Greece, USA, Italy, China, Belgium, Thailand, South Korea, and United Kingdom, discussed the current issues on interoperability and availability of agricultural data. They discussed data visibility – where data is published and how searchable it is; its lifecycle – the long-term availability of data, taking into account format format perenity, secure storage and specific minimal metadata. They also considered data elaboration levels – raw, elaborated or download and web service, and resource identification: how data is named and shared; if it is unambiguous or unique, machine-readable, open access, consistent format, persistent. On the action front the Group addressed the need to build a framework to connect and update existing ontologies; specifically, a main entry point to vocabularies, with a distributed approach but central registry and unified querying functionalities. This type of portal would leverage technology that is already available through the AgroPortal, the VEST Registry and Global Agricultural Concept Scheme (GACS) and would interlink with other registries like the CIARD RING, building on the concept of AgriSemantics discussed in previous meetings. Interest levels from many international organisations in this kind of framework would be high. Elsewhere, action is needed on standardizing farming management information systems (FMIS). Standard vocabularies and harmonized variables to be promoted in FMIS as well as mapping between crop list vocabularies, and grape ontology extension. An additional action agreed upon by all participants is that data sets from all institutions should published in The Open Data Journal for Agricultural Research. Because of the scope of the framework building, the Group agreed to put the wheels in motion on one or more new Working Groups (WG), under the provisional title: AgriSemantics. A person from INRA and a person from FAO / GFAR / GODAN would chair the WG. For more information, take a look at the data Interoperability group IGAD presentation, here. 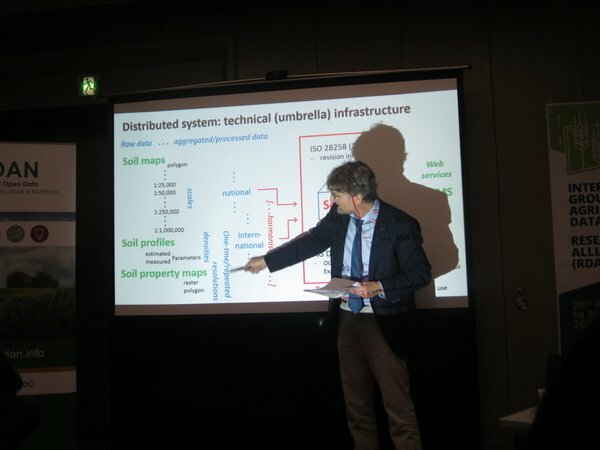 Rainer Baritz, chair of the Soil Data Working Group presented an action plan to test and revise the SoilML standard for Soil Data Interoperability, using content-related case studies. Thirteen persons from Italy, India, Japan, Australia, China, The Netherlands, USA and Thailand participated in the discussions. 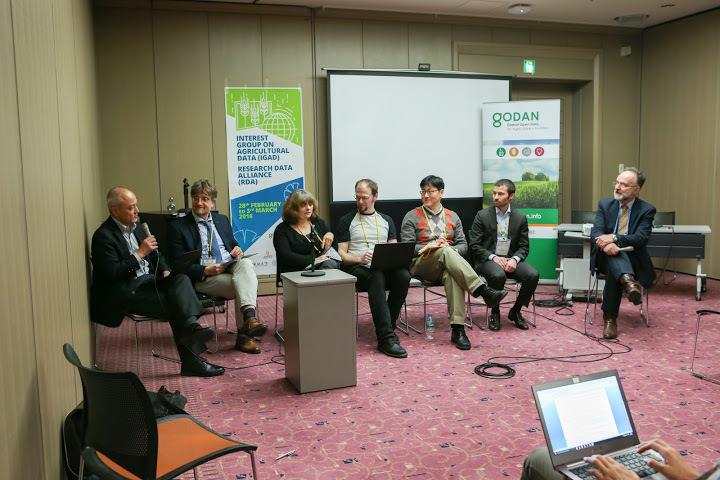 As well, the Group proposed a 2016 Action plan involving a SoilML final interoperability test, and said they would like to work with GODAN on developing global tests for shared sample data services. Acknowledging that harmonization and interoperability have different meanings for different experts, they praised the healthy turnout from Japan and China, and dubbed the meeting an important event for future action. The Group recognised the difference between regional data and internationally usable data, but said one umbrella solution is needed for all. Existing ISO doesn’t allow for full interoperability of data sets, and the global standard (undertaken by few people) should be adapted globally. Speed is of the essence: soil experts are given a decade to implement standards. This is too long. Also important is that soil groups forge alliances with other initiatives, with SoilML as the umbrella model. The Group acknowledged that soil data is often closely guarded by lobby groups. However, new European standards on sharing environmental data have meant the research community is getting stronger. Guidance is needed for the final SoilML based on interoperability tests and this will most likely come from FAO, with an end goal of September 2016. (This could prove ambitious). However, collaboration with GODAN is a step in the right direction. 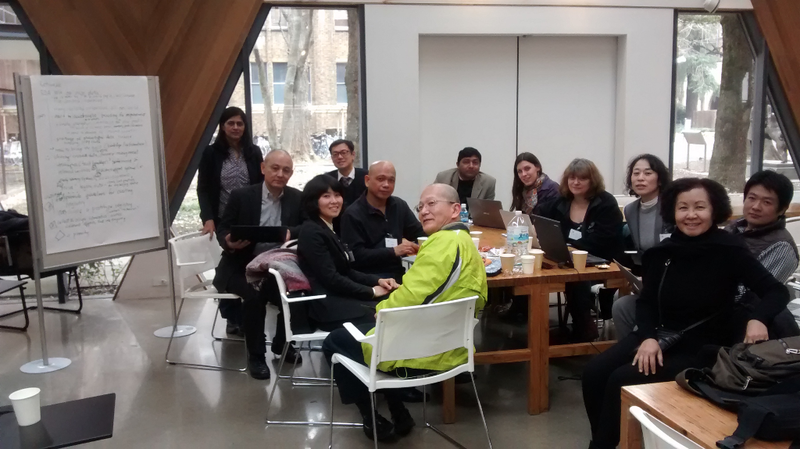 The group agreed to take steps to develop a concept note to present at the GODAN summit. You can read the Soil Group IGAD presentation, here. 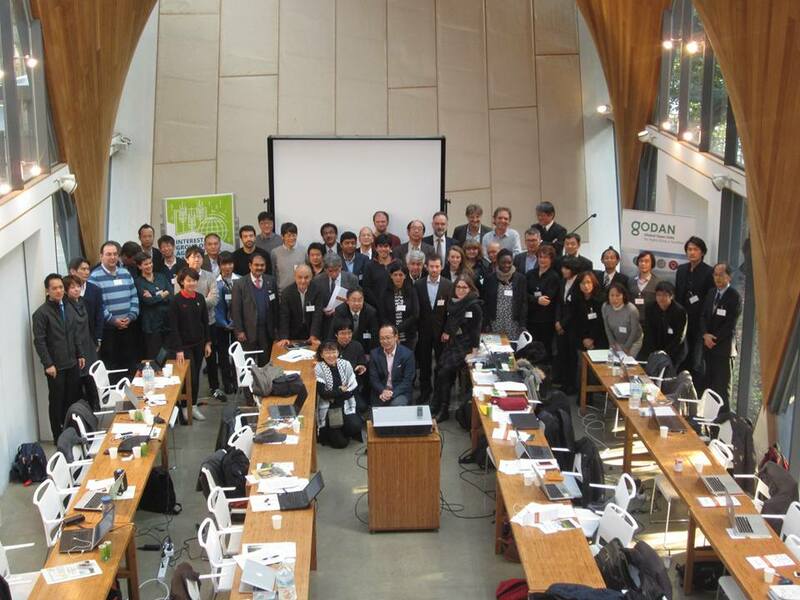 Chaired by Ramil Mauleon and Elizabeth Arnaud the Group composed by twelve participants from India, Thailand, Japan, France and Germany asked whether the successes and best practices of the Wheat Data Interoperability Working Group could be replicated with rice. Focusing on the big picture, they noted the unique domain properties of rice. Climate change and increased demand are putting the pressure on for new resilient crops, and rice breeding needs to be speeded up. A shortage of available phenotypic data hinders breeding programs, and global rice data resources are disconnected. Heterogeneous research data from different research groups exists: these are information on Germplasm, pedigree, genetics, genotyping and phenotyping from a narrow genetic pool that is the outcome of the first Green Revolution in rice, tested around the world, and it is vital to get access to that data and to share it. In essence, rice data is big data. Bringing the International Rice Informatics Consortium (IRIC) into the RDA Rice Data Working Group will help open up access to rice information. The IRIC works toward making rice data sharable and usable in the rice community, with germplasm diversity as a focal entry point. It has held yearly workshops at the Plant and Animal Genome Conference since 2014. Put together a survey to gather different type of Rice data, input from China is necessary (no representative was present in the DG). Adapt outputs from the Wheat Data Interoperability Working Group to rice datasets. Deal with the heterogeneity of data sets: develop data registry of relevant available rice data sets. Focus on development of best practices for digitalization of legacy data, using India’s effort as a model, and apply to Thailand (and Japan), making its national data legacy available. The Group to prepare the proposal to set up a new RDA Working Group, focused on the above. GODAN offers financial support for travel funding. GODAN chair André Laperrière kicked off the breakout session with a discussion on the ethics of open data, including tackling data unreliability and misuse. He acknowledged that open data brings knowledge to farmers, but said that it opens up a whole side debate about ethics and privacy, especially with regards competitiveness in the private sector. Undoubtedly, filling in the gaps in agricultural data paves the way for improved food security, but it is important to comprehend the potentials of open data. The Group flagged-up issues of data ownership, protection, and knowledge sharing, noting that technology often fails to filter down to farmers. One response was that agricultural initiatives should open up their knowledge bases to make a bigger impact at a grass roots level. Raw data versus processed data also comes under the spotlight: farmers may not understand raw data, although it is highly useful in research. If the goal is to let as many people as possible benefit, perhaps it’s wise to open up access to mature data, Laperrière suggests. The Groups also mulled how to best release data so that private companies don’t misuse it before it reaches farmers? Time limited data release based on INRA’s experience is put forward as one option: make data available for a short time period, or only open it in academic circles. Another consideration is drawing awareness to data that already exists – so called “low lying fruit” that is being woefully underused. Visibility for data sets should have easy and beneficial mechanisms for researchers, the Group said. Rescuing historical, pre-digital data is another part of the picture . The Gates Foundation is currently funding some data rescue. However the group discussed whether it is worth the time and effort to rescue realms of non-digitised data? This sparked a back and forth, with ideas mostly in favour of “Wikpedia” style open data. Those in the pro camp pointed out that it is vital to establish best practices in data management, and that the scale of workmanship on a platform like Wikipedia inevitably leads to precision. Like Wikipedia, the more people “annotating” the more reliable the data. A short summary of the discussion was that Open Data is important to empower people and to support progress in science. Beeing critical with ethical question regarding Open Data is important for improvements. However there should be no fear of taking the best out of this movement. Already existing data sets as well as pre-digital data might be underestimated sources to be opened in order to get information that cannot be found elsewhere. Talks finished with an announcement about the Open Data Challenge at the end of March (check the GODAN website for more info.) Winners will be invited to take part in the summit in September. Jawoo Koo: IFPRI – Data in context of development countries. Currently not enough transparency for stakeholder decision. Cyril Pommier: INRA – Benefit of open data goes beyond openness. Metadata to ensure that data stays permanent? Elizabeth Arnaud: Bioversity international – if data isn’t open, it’s difficult to identify data gaps for stimulating knowledge exchange in agriculture. How to encourage people to share knowledge?